A man who's spent over 20,000 hours playing Lineage II is suing NCsoft, claiming his addiction has made him unable to function in real life. NCsoft has had a tough time in court recently, what with the $28 million victory Richard Garriott won from the publisher last month. It's probably safe to say that NCsoft was hoping it could avoid seeing the inside of a courtroom for quite some time, but it seems that such hopes were in vain. Now, the company finds itself the target of a new lawsuit from one of its most loyal players because he claims Lineage II is so addictive that it has effectively ruined his life. 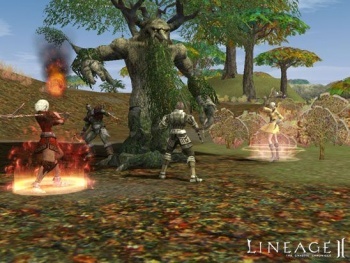 Craig Smallwood of Hawaii is seeking unspecified monetary damages from the MMOG publisher because, according to the lawsuit, the man's addiction to Lineage II caused him to log over 20,000 hours with the game between 2005 and 2009. In layman's terms, that means the man spent over 833 days (or 2.28 years!) playing the MMOG. As a result, the man has become, "unable to function independently in usual daily activities such as getting up, getting dressed, bathing or communicating with family and friends." Smallwood claims that NCsoft is negligent (and thus liable) because it failed, "to warn or instruct or adequately warn or instruct plaintiff and other players of Lineage II of its dangerous and defective characteristics, and of the safe and proper method of using the game." Exactly how one should play an MMOG in a "safe and proper method" isn't really explained, but I would love to hear that argument in court. The last time I remember seeing a lawsuit like this was back in 2002, when Samuel Hirsch tried to sue a number of fast food restaurants for making their meals so tasty that they became addictive, resulting in his obesity and subsequent health problems. If history is due to repeat itself, then one would think Smallwood's lawsuit would also be dismissed. However, the presiding judge refused to dismiss some of Smallwood's claims, so it seems that the suit might actually make it to trial. That said, NCsoft submitted a filing on Tuesday requesting that the entire suit be dismissed.